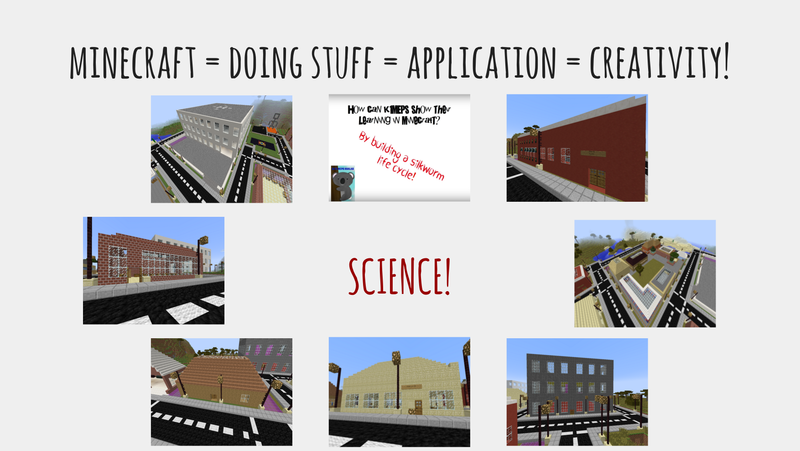 Minecraft across the curriculum: K-6. A few weeks ago I presented at a teachmeet at the the Sydney Powerhouse Museum, AKA the Museum of Applied Arts and Sciences. The topic was STEM (Science, Technology, Engineering and Mathematics) + X (STEM+X). The idea was to share some of the things you have done and/or are doing in your classroom or workplace around integrating STEM with other KLAs, for example, a STEM and PE project would be STEM + PE. 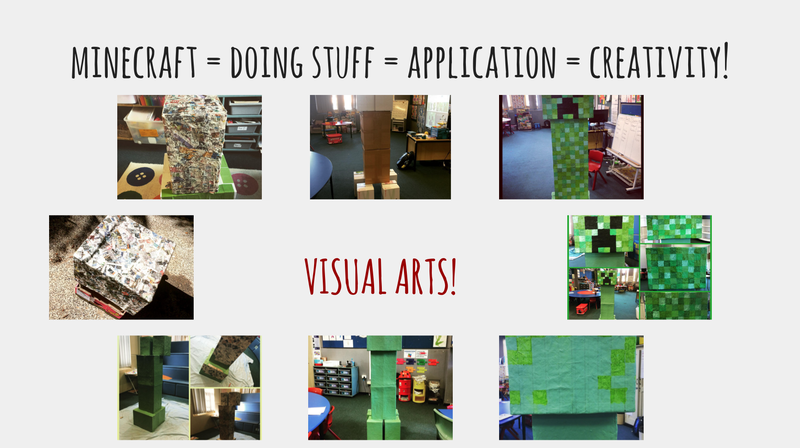 When I was asked to present, I thought it would be a great opportunity to share how I’ve been using Minecraft in my classroom over the last few years and how it really can be used across all subject areas. Just like the ‘play’ within the game itself, what you do with it in the classroom is only limited by your own creativity and that of your students. Below I will share some of the cool things that my students and i have done and how they link to KLAs across the curriculum. Above are some screenshots of some science projects that I have run with my students. 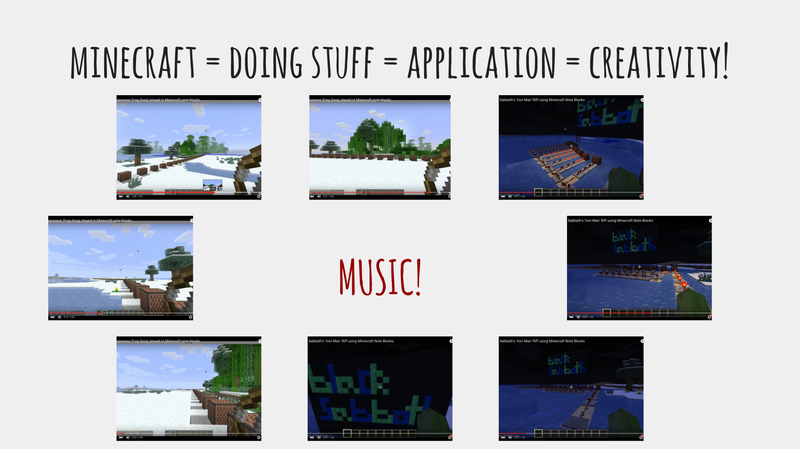 Last year, my students completed a project with the driving question, “How can K/1L show their learning in Minecraft?” One of the groups made a representation of a silkworm life cycle by building the different stages and then sharing a screencast and overlaid audio to demonstrate what they’d learned. Now, not only does this video demonstrate sound knowledge of stage 1 science outcomes, it also demonstrates how my students have achieved outcomes in the English syllabus by creating multimodal texts and reflecting on their own and others’ learning. The other screenshots are of the seven buildings my year 1 class made during a science project in which they had to build a city in Minecraft. The driving question was, “Can mini MEPS people design a dream city?” Again, this crosses outcomes across both the science and English syllabuses. There was even a bit of stage 1 mathematics in there as we discussed the different areas and volumes of the buildings and had to count and measure distances between windows and doors with pinpoint accuracy. Plus it was loads of fun. My class still love visiting Lionfish City! Above are some screenshots of some work done in a Minecraft mod called Computer Craft. With this mod you program a little computerised turtle to build and dig for you. I made mine build a house for me and at the moment I have students from year 1 through to year 4 working regularly on Thursday mornings and within my year 1 class on a Friday to challenge themselves to do the same. Some of them are up to the point where they can get it to build four walls, and I will be teaching them how to write a ‘for’ loop in Lua so they can get the turtle to change inventory slots when it runs out of blocks. It’s a really cool mod, because unlike more basic programming tools like Scratch, you can actually switch between a visual, block style editor and a programming editor which allows the keener kids to get a sense of what’s going on with the actual language itself. If kids can understand that, then they are taken a decent step towards a proper understanding of programming. Now, computer programming isn’t in the NSW primary curriculum yet but there is strong talk to suggest that it soon will be, and kids who are doing this kind of stuff in Minecraft are already ahead of the curve. 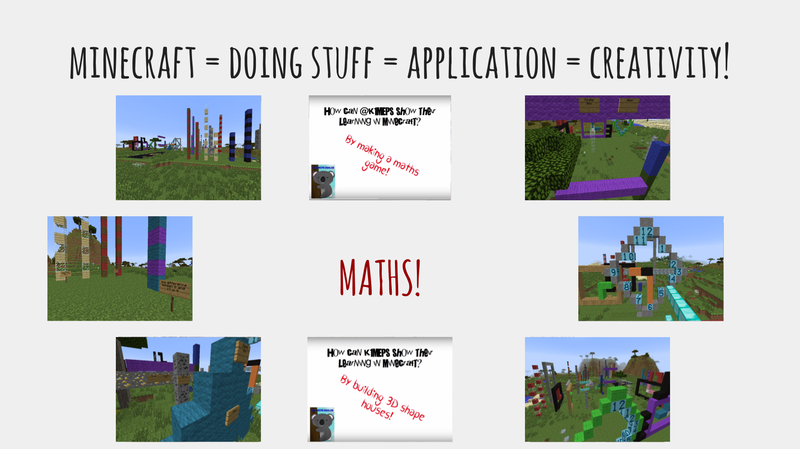 I have been using Minecraft a lot this year for extension in mathematics. For example, if a kid in my class totally nails what we are working on during our first lesson, there is no need for them to be sitting with the rest of the class who need further practise or additional (pardon the pun) help from me. In many cases I set them a Minecraft challenge, such as building a clock to show me a certain time to the half hour (as above) or showing me the difference between two numbers by building a series of towers and writing the number sentence on a sign (as above). As with the videos shown above in the science section, last year my K/1 class made some maths themed Minecraft videos in order to demonstrate their learning. One group made houses out of 3D objects such as rectangular and triangular prisms, another shared knowledge of equal groups (multiplication), while another made a truly impressive and remarkable maths game in which are presented with a series of addition problems which increase in difficulty as the game progresses. Watch the video to see how it works. Again, these videos cross outcomes across several KLAs. So, that’s the STEM stuff covered with Minecraft, how about the + ‘X’? Well, my friends, read on to find out! 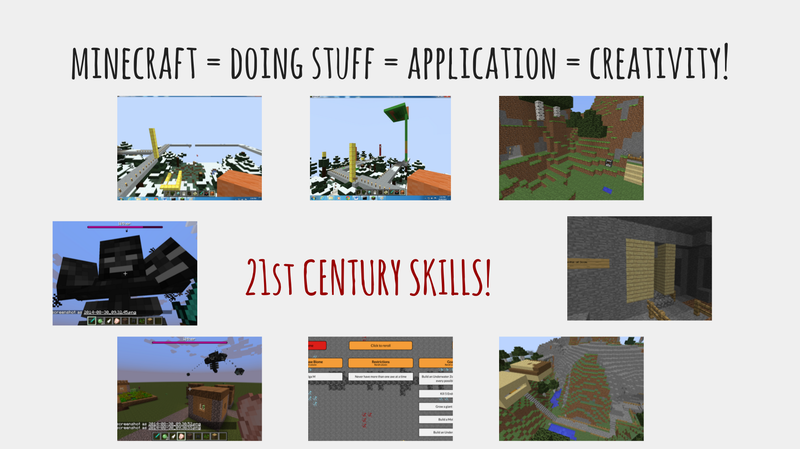 I’ve already mentioned how making videos in Minecraft is great way to work with the English syllabus. There’s a lot of teaching and planning that goes into each video as kids storyboard and write scripts to plan for what they will be saying over each video. Of course, as they speak over each video, they have to make sure what tey are saying is clear and audible – hence, talking and listening! Above are some screenshots of videos about Minecraft castles and dragons made by the K/1 Koalas last year. We read a bunch of stuff about castles and dragons and watched a whole bunch of videos to make sure we knew enough about each topic to speak over our videos. Again, it was loads of fun. Who wouldn’t want to learn about castles and dragons!? 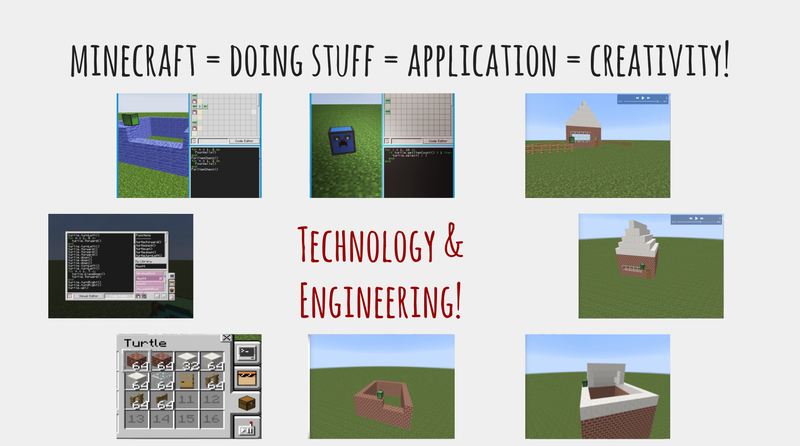 My students also do a lot of writing about what they do in Minecraft. You see screenshots of a Minecraft story written by one of my students very early in the year using Storybird, as well as some great writing by another of my students using Kidblog. It’s a cute little Minecraft love story which she wrote at home and then brought in to school so she could type it up on her blog and search for digital images to add to it. I also teach my kids to search for images that are ‘labelled for reuse’ so that they are aware that it’s inappropriate and illegal behaviour to go around breaking copyright laws. All this at age 6! Now, there are any number of ways you can link art with Minecraft. You could get kids to do cool Minecraft paintings and artworks, or you could get them to make some interesting visual art themed builds based on their favourite artists. The limit is only placed by how creative you are in your thinking. With my class, I decided to make an epically large, life sized gigantic creeper out of cardboard boxes and papier mâché. It took weeks and we had heaps of fun and made A LOT of mess. I still need to finish off the ‘pixels’ on top of his head and make it waterproof with some outdoor acrylic varnish. The kindy kids at school want to use it to post sight words on and do a weekly creeper hunt to find him located in random spots around the school. 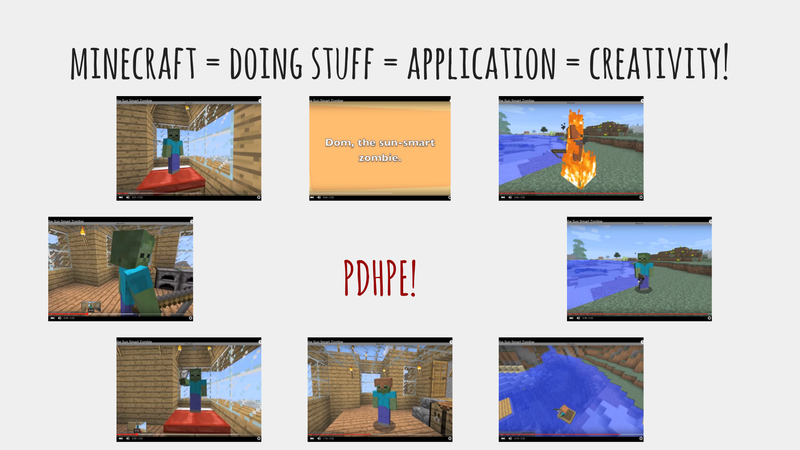 See, there’s that cross-curricular Minecraft stuff in action again – sight words! Above you can see screenshots of a video I made for a year 3 class a few years ago, all about sun safety. It’s all about a zombie who sets off to go fishing with his friend, Ralph. He is a very sun smart zombie and before he leaves the house he makes sure to put on his sunscreen and a hat. When he meets Ralph, he discovers that he is not so sun smart and has forgotten to protect himself. He subsequently bursts into flames! I made this as a lesson intro but you could quite easily get students to make similar videos about a range of health related issues, such as healthy eating and hygiene. Again, the only limit is your creativity. More videos made by me. One is of a cute little Japanese song called ‘The Frog Song‘ which I learned with the same year 3 class for whom I made the sun smart zombie video. I made the song by tuning note blocks in Minecraft and linking them to pressure plates to walk across. I then took a screencast of me walking across them to play the song. The other video is one I made of note blocks being linked to red stone circuits in order to play the intro Black Sabbath’s ‘Iron Man’, I got the timing a bit wrong, but hey, it was my first attempt and red stone circuitry is tricky! I am yet to do this with a class, but when I do, I would love to teach them the frog song and get them to go and build it Minecraft using red stone circuitry, maybe when I get a stage 2 class. It will be loads of fun. By now you would have heard a lot of talking about the need for kids to be equipped ’21st Century Skills’ such as communication, creativity, critical thinking, problem solving, digital citizenship and ICT capability. How do we teach these skills? The ICT capability component is quite obvious with Minecraft, kids need to be able to navigate their way around a 3 dimensional computer world, using computer controls, while learning basic coding skills and knowledge of things like ip addresses in order to log on to your class server. However, what about some of those other skills? There is a lot of ‘incidental learning’ which takes place on a Minecraft server. For example, in the screenshots above you can see a wither (a three headed Minecraft monster which flies around shooting flaming skulls at anything that moves). Now, obviously you don’t really want one of these flying around your server shooting at everyone and destroying all of your builds. Last year, however, one of my students purposely spawned one of these creatures in our class world, and it set about causing destruction. This prompted a server shut down and a lengthy class discussion around what it means to be a good digital citizen. How your online actions affect the online experience of those who share the same space. My students agreed that the wither spawning had not been a good idea and the student involved went on to write an apologetic blog post about what he had done and why it had been a bad idea. A blog post by a year one student regarding digital citizenship! I also run a school Minecraft club on Wednesdays and Fridays in which I set club challenges using a Minecraft challenge generator. The amount of collaboration, communication and problem solving which goes on in these short meetings as students work together to meet these set challenges is amazing. Sometimes I jump in the world to help them solve these problems, but mostly I’m just there in the background watching as they work through the challenges together, all the while creatively mining and building away. 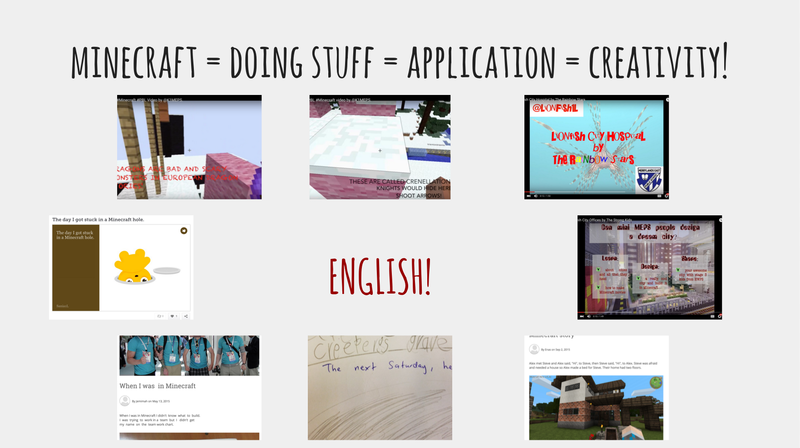 So there you have it, these are just some of the ways I have used Minecraft ‘gaming’ in my classroom and I’m sure I’ll find more awesome ways in future. You can see my presentation below if you’re interested, but I’ve basically just written you through it. Thanks for reading! Categories: Uncategorized | Tags: 21st century skills, Art, blogging, curriculum, Education, Elementary School, English, game based learning, learning, maths, Minecraft, PBL, primary School, project-based learning, School, Science, STEAM, STEM, technology, writing | Permalink.